SAGE – Fracking Goes to Court: Will State or Local Government Determine America’s Energy Future? Will local residents earn the right to make land-use decisions in their own communities? Photo by CREDO.fracking. The debate over whether hydraulic fracturing is an economic blessing or an environmental curse often gets hung up on insufficient science. The study of fracking and its impacts is still a nascent field, and there’s still a lot we don’t know about the practice’s economic benefits, health risks, and environmental impacts. The scientific arena, however, is not the only sphere in which fracking is being debated: the law has a lot to say about hydraulic fracturing, too. Court rulings may yet determine how fracking develops in the U.S. and, just as importantly, who gets to decide where fracking can be conducted. 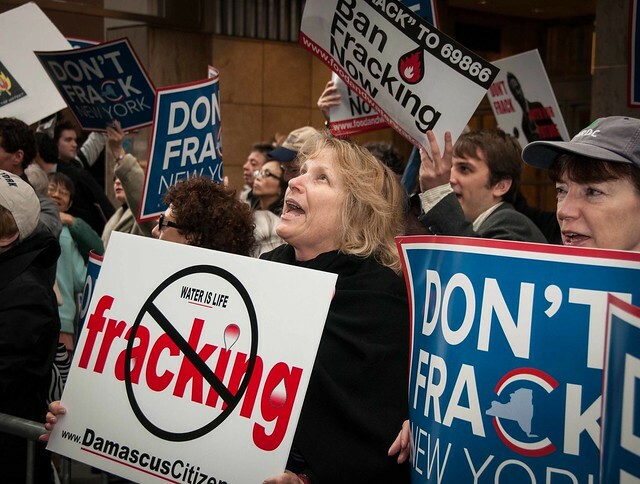 In New York State, which has maintained a hotly-contested moratorium on fracking, a legal provision called home-rule is well established. Home-rule gives local government the power to make decisions on land use and zoning, thereby providing local residents the opportunity to participate in decision-making and the authority to decide what activities and industries actually benefit their communities. How New York’s Oil, Gas and Solution Mining Law is interpreted in court will play an important role in answering the above questions. According to New York law, while local authorities retain jurisdiction over roads and real property tax law, state legislation supersedes all local laws related to oil, gas, and mining regulations (Section 23-0303(2), for the legal wonks out there). Seems like a clear-cut case of state supremacy, right? Well, not exactly. The definition of “regulation” is hotly debated — and while this might seem like a semantic quibble, the choice of definition has big ramifications. Typically the word “regulation” refers to the state’s role in overseeing the industry’s operations, such as the chemicals used in the fracking fluid, the management of the contaminated flowback water that comes out of the wells, and other mechanical aspects of fracking. The controversy lies in whether the state can also override local government on the location of wells, or whether local zoning reign supreme. In other words, is the placement of fracking wells a regulation that state government has control over; or is it a local issue subject to home-rule? It is clear what side of the argument local governments take. Several New York towns have amended local zoning to prevent fracking anywhere within their communities. These actions build on precedent set by the state’s Mined Land Reclamation Law, which has twice been held to allow local governments to dictate the location of mines (but not how they operate). Despite this precedent, however, the law is far from settled. There are currently two prominent cases being tested in court, the results of which could go a long way toward determining how much say local governments have in whether fracking can occur within their communities’ borders. In one case, a natural gas company called the Anschutz Exploration Corporation challenged the Town of Dryden’s decision to prohibit natural gas exploration and drilling through local zoning laws. Despite the challenge, the Supreme Court upheld the local law in February 2012 –– ruling that, while regulating the industry is the responsibility of the New York Department of Environmental Conservation, Dryden’s zoning amendment actually dealt with land-use decisions, not industry regulations. The case represented a clear victory for local government. Similarly, in a town called Middlefield, residents evoked a local law in 2011 to stop natural gas development in order to protect the community’s character and its water supply. Midfield was challenged by a local dairy that had leased land for gas development, but again, the Supreme Court upheld the law. Another ruling in favor of the community’s right to decide. While the Midfield and Dryden cases have so far granted ultimate authority to local governments, the communities’ victories are by no means assured: both are currently under review in New York’s intermediate court of appeals. If local zoning rights ultimately hold, then towns in New York will have the right to regulate fracking activities through zoning and land use ordinances. But even if courts overturn local rights, towns will still have some ability to shape fracking activity through their decisions about road development. Fracking requires roads for heavy trucks to transport fracking fluid, sand, waste, and well machinery, causing air and noise pollution and other environmental harm to the landscape. Town action to control road development may include new processes for road permitting, provisions to shape where roads are located, development fees, and securing commitments for restoration and damage liability. Additionally, under New York state law, towns develop comprehensive plans to manage future growth and change. These comprehensive plans provide yet another opportunity for towns to prevent negative impacts and maximize benefits from fracking. Communities can use their plans to develop local consensus around fracking, articulate their goals and strategies, and assess risks to vulnerable areas. These plans engage the public in the decision-making process, and may help influence New York’s Department of Environmental Conservation in their permitting decisions. Ultimately, the courts will set a precedent that prioritizes either local or state authority in local decision-making. The complexity of the fracking debate, spanning from environmental protection and public health to energy dependence and national security, demonstrates how local issues can quickly take on regional, national, and even global importance. The Federal Environmental Protection Agency has remained relatively distant from ongoing state deliberations, and in the meantime New York’s Governor Andrew Cuomo has maintained the fracking moratorium despite heavy pressure to lift it. New York’s experience represents just one example of the jurisdictional debates breaking out in states across the country. The tension between state and local authorities raises questions regarding our federal system, and opens the door to exploring a more cooperative and comprehensive approach to this critical public health, environmental, and economic issue. How the tensions between state and local rights play out will go a long way toward determining who will decide fracking’s future. *This post is based closely on the following recently published, peer-reviewed journal article: Nolon, John R. and Victoria Polidor, “Hydrofracking – Disturbances Both Geological and Political: Who decides?”, The Urban Lawyer, Vol. 44, No. 3 (2012).